The MSF Basic RiderCourse is designed for beginning riders of all ages. More than 7 million motorcyclists nationwide have graduated from a RiderCourse since 1974. Approximately five to eight hours classroom-style instruction, which may include (at some sites) the Basic eCourse that you complete at home before attending your first formal classroom session, and prepares the student for the approximately ten hours of practical riding in a controlled, off-street environment, typically a parking lot. Motorcycles and helmets are provided free of charge for your use during the course. In the classroom, you’ll learn about the different types of motorcycles, layout and operation of the basic controls, and how to become a safer, more responsible rider. You’ll review the different types of safety gear worn for protection and comfort. You’ll find out how alcohol and other drugs impair your ability to ride safely. 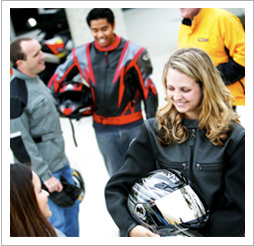 Next, you’ll move to the riding range and your RiderCoach (an experienced motorcyclist certified by the Motorcycle Safety Foundation) will start you off with straight-line riding, stopping, shifting, and turning. You’ll gradually progress to swerving and emergency braking. Click here for a complete description of the curriculum. The course concludes with a knowledge test and a riding skill evaluation. Once your RiderCoach hands you the course-completion card, you'll be happy knowing that you’ve gone the extra mile to develop your own safe riding techniques. Your introduction to the wonderful world of motorcycling has just begun! Find a RiderCourse near you.